Handcrafted wood furniture, cutting boards and candles. Announcement In or near Connecticut? Come visit Iron & Walnut! Our showroom is located at: 909 Whalley Ave. New Haven, CT 06511. By Appointment Only - message, call or text (203) 200-0655. In or near Connecticut? Come visit Iron & Walnut! Our showroom is located at: 909 Whalley Ave. New Haven, CT 06511. By Appointment Only - message, call or text (203) 200-0655. 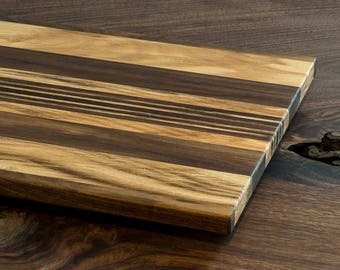 I ran across Iron and Walnut on Etsy when searching for a cutting board for my mothers new kitchen. There were many styles to choose from so Alex sent me pictures of the ones he had finished and I chose from there. I let him point me in the right direction for wood type and stain that would look great with the colors in the new kitchen. The final product, as you can see in the picture, exceeded my every expectation. Alex and Liz were incredibly hands on and helpful during the entire order, I definitely plan on coming back to them in the future! Love this shop - beautiful table, great service. All of our friends ask where we found the table. Thanks Iron and Walnut! The folks at Iron and Walnut delivered on all fronts with this custom project. The ease of communication was key to get the project off the ground. Their attention to detail and design made for a wonderful fit to a tight space. Alex and Elizabeth provided quality materials built to last. Will not hesitate to contact Iron and Walnut with our next project. Harriet is the backbone (and paws) of the operation. Operations Manager. Durability tester. Security guard. Cheerleader and anything else the day demands!